SPRINGFIELD, Mass. – Mayor Domenic J. Sarno, a native of the City of Springfield, today announced his endorsement of Judge Mary Hurley (ret. ), candidate for Governor’s Council in the 8th District. “I first met Mary when she was running for City Council in Springfield, I met her when I was 16, holding a lawn sign. 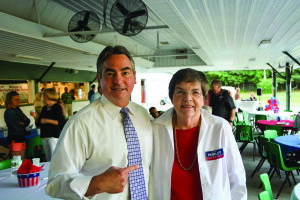 Right then I knew she was someone special,” said Mayor Domenic Sarno. “When she ran for Mayor I was thrilled to support her then and honored when she asked me to serve in her administration, as an administrative aide. I can’t tell you how much I learned from her when she was Mayor. She served the people with honesty and integrity. Ultimately Mary guided the city through its worst financial crisis, leaving the city in great financial shape. “I continued to watch her career as a judge in the District Court, where she was firm, but fair, with the right amount of compassion.